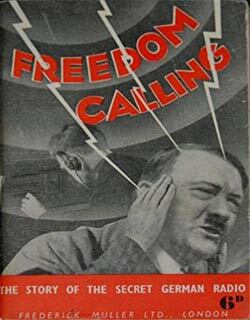 Freedom Calling was the first book jacket Heartfield designed in England. Heartfield had recently fled to England shortly before the Nazis invaded Czechoslovakia where he lived in exile. The book was published by Frederick Muller Ltd. in 1939. The authorship of it was assigned to “The Representative in Great Britain of the Freedom Station.” In fact, it was written by Jurgen Kuczynski. Allegedly, Freedom Calling was financed by the Free German League of Culture (FGLC). Heartfield and Kuczynski were both members. Initially, FGLC was a non-party, anti-Nazi and anti-Fascist refugee organization with the declared aim “to preserve and advance Free German culture and further the mutual understanding between the refugees and the British people.” Among the founders of the FGLC were Fred and Diana Uhlman. Heartfield owed a great deal to the Uhlmans. They took him under their wing after he reached England and let him stay in their Hampstead home rent-free for four years. Fred Uhlman was a German lawyer and anti-fascist socialist who had escaped Nazi Germany and had become a well-known artist and writer. Heartfield and Uhlman shared the shock and trauma of their world coming apart. But they were also both persecuted by the Nazis for political reasons and their Jewish family background. However, their status was different. Heartfield was a penniless transmigrant. Fred Uhlman’s wife Diana, on the other hand, belonged to one of the oldest aristocratic families in England and was financially independent. Fortunately, she was very generous. The Uhlmans’ were known for helping artists find work whenever they could. Undoubtedly, Heartfield would have been an obvious choice for designing the cover of Freedom Calling. He was famous for his book jackets, especially the ones he had designed for Malik Verlag. But, Heartfield had a temporary visa. This meant he didn’t have a work permit. So, his involvement would have to be arranged discretely. The lack of a work permit might explain why Heartfield didn’t sign this montage and Kuczynski wasn’t named as author. Refugees were also not allowed to be politically active. But, Heartfield was an expert for brainteasers and hidden clues. He simply sneaked his image into the montage. He is the transmitter operator wearing headphones you can spot in the background. Freedom Calling was written in English. Therefore, its target group was an English speaking audience. Heartfield did not speak much English at the time and wasn’t familiar with the English culture. This meant he needed a simple approach to interact with his audience. So, he reverted to universal collective symbolism. The radio waves are visualized as expanding circles like ripples produced by a pebble thrown into the water. This is an image most people are familiar with. A tiny object flung into water has far-reaching effects. It causes movement and upsets the existing order. The sole recipient of Heartfield’s message is Hitler. It’s a duel of two people but also a duel of two principles. Heartfield is a civilian. Hitler is a military dictator. By the time the waves reach Hitler they have turned into thunderbolts striking its target. Hitler is shielding his ears with his hands. This implies that words are a powerful weapon. Note also, Heartfield is sitting while Hitler is standing. Heartfield doesn’t even have to face Hitler to cause agony. All it takes to make Hitler cringe is the light touch of the right operator. Radio is a powerful medium for spreading information and propaganda. In Heartfield’s time the radio was a relatively new medium. The Nazis were well aware of its propagandistic potential. They mass-produced radio sets called People’s Sets to lower prices. These radios could only receive German stations. Then, the Nazis made sure many German households had a People’s Set quickly. Now they could brainwash people at home. The Propaganda Ministry censured the content of the radio programs and free radio stations were jammed. This way the Nazis created a bubble of ignorance. Yet, radio programs played a major role in undermining Nazi propaganda. There were various types of radio stations that put up a fight against Nazis. National radio stations operating from free countries and pirate stations operating from outside Germany or unoccupied countries that managed to evade jamming. The BBC was an example of a public radio station operating from a free country. Until 1938 it only broadcast in English. Shortly after World War II broke out, it broadcast in many languages. The Nazis were well aware of the impact of BBC broadcasts – so much so, that the Luftwaffe bombed the BBC several times. Freedom Radio 29.8 (Deutscher Freiheitssender 29,8) was a pirate station. Originally it was a KPD organ. Later it became a voice for a broad spectrum of the German opposition. Freedom Radio was supported by people like Heinrich Mann, Lion Feuchtwanger, Prince Hubertus Loewenstein, and Milly Zirker. Freedom Calling describes the activities of this pirate station and served as a guidebook to anti-fascist resistance. It encouraged passive resistance, sabotage, strikes and whispering campaigns. It detailed tactics to set up resistance groups and described strategies how to avoid being caught by the Nazis. It explained how to pass on information and detect spies. It stressed the need to optimize communication by keeping messages short and simple and to use watchwords. It emphasized the importance of undivided solidarity with victims of Nazi persecution and condemned anti-Semitism. Listening to foreign broadcasts was forbidden in Germany. It was also illegal in every country the Germans occupied. Penalties ranged from heavy fines and jail sentences to death. Enforcement of the penalties seems to have varied in the different countries. Allegedly, enforcing penalties was particularly harsh in Poland. The Polish resistance movement was very strong and the Nazis considered Poles as subhuman. So, Nazis cracked down on Polish resistance mercilessly. But, many people listened to free radio stations anyway and passed on whatever they managed to pick up to people they trusted. Listening to free radio stations gave people hope and helped anti-Nazis defy feelings of despair and isolation. It helped people to survive and make informed decisions. In 1948, the atrocities of the war and the Holocaust caused the UN to adopt The Universal Declaration of Human Rights. – All human beings are born free and equal in dignity and rights. – No one shall be subjected to torture or to cruel, inhuman or degrading treatment or punishment. – No one shall be subjected to arbitrary interference with his privacy, family, home or correspondence, nor to attacks upon his honour and reputation. Everyone has the right to the protection of the law against such interference or attacks. – Everyone has the right to freedom of opinion and expression; this right includes freedom to hold opinions without interference and to seek, receive and impart information and ideas through any media and regardless of frontiers. Human rights are still under massive attack. Let us promote and defend them wherever we can. For this article I am greatly indebted to Caroline Compton who inspired me to research the role of the radio during the Nazi period and kindly shared her extensive knowledge with me.